The frequency of misdiagnosis, especially of gifted and twice exceptional students, is one of the reas ons I decided to go into the field of assessment as a specialist in these populations. Too many families go to the trouble and expense of having an assessment conducted only to be given incorrect or incomplete information about their child. I have been through this myself as a parent. And I have seen it time and time again among the families I work with. Misdiagnosis can create lasting damage, derail children’s educations, and result in worried days and sleepless nights for children and parents. 1. Hidden abilities and weaknesses: Most gifted and twice-exceptional learners have complex profiles with unique patterns of strengths and weakness. Their strengths often camouflage the expression of their weaknesses (resulting in failure to identify learning difficulties or disabilities) and their weaknesses often camouflage the expression of their strengths (resulting in failure to identify strengths and giftedness). What on the surface may appear to be an average student is often a student with exceptional abilities and exceptional weaknesses "averaging" one another out. 2. “Symptom” confusion: The markers of conditions may appear to overlap. Gifted learners and learners with ADHD both have low tolerance for boredom. Gifted learners and learners with Asperger’s both have a tendency to focus intensely in areas of personal interest. Students with dyslexia may appear to have ADHD if they act distracted or disruptive when its time to read aloud or write. 4. Lack of training in giftedness and twice exceptionality: The psychologist conducting the assessment may not have received much training, if any, in these areas. You may be surprised to learn how little time is spent in most psychology training programs on the assessment of intelligence and learning. Most programs include no training in giftedness or twice exceptionality whatsoever. Furthermore, because many psychologists who conduct assessments work with a broad variety of children and do psychotherapy or other kinds of work in addition to assessment, their knowledge of giftedness and twice exceptionality may not grow much with experience. Some may see only one or two gifted or twice-exceptional students a year. Teachers tend to be equally unfamiliar with the characteristics of these children. 5. “Gifted” is seen as a four letter word: Some kind-hearted people think that it is elitist or unfair to describe or think of a child as gifted because it implies that they are “better than” or “superior” to others. This may be driven by a desire to be inclusive, treat everyone equally, and make people feel good. Strangely, not every child is expected to be equally gifted at sports where it is “allowed” to describe a child as athletically gifted. But it isn’t very “politically correct” to focus attention on intellectual giftedness and really hasn’t been since the 1950’s. 6. Misinterpretation of diagnostic criteria: The criteria psychologists use to make diagnoses are generally taken from the APA’s Diagnostic and Statistical Manual (DSM-5). One area of misunderstanding is that psychologists and school staff may be under the impression that a student has to be performing below the average level (e.g. below the 25th percentile) for their age or grade to be diagnosed with a learning disability. This is actually not true. Under “Diagnostic Features” the DSM-5 states: “academic skills are distributed along a continuum, so there is no natural cut point that can be used to differentiate individuals with and without specific learning disorder,” and “specific learning disorder may also occur in individuals identified as intellectually gifted. These individuals may be able to sustain apparently adequate academic functioning by using compensatory strategies…” Thus the code acknowledges that a gifted student may perform at the average, or “apparently adequate” level, yet still have a learning disability. But many school staff and even psychologists haven't read the fine print. 7. Incomplete, cursory assessment: To do a top-notch assessment requires gathering a lot of background data and test data while applying critical thinking skills, testing hypotheses, and being willing to keep looking until the answers are revealed. 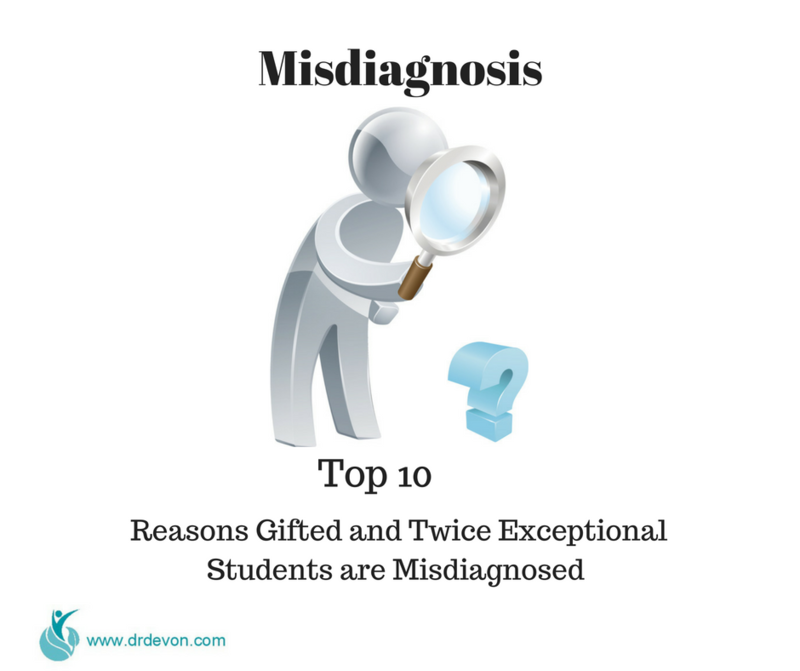 While some diagnoses are clear-cut and relatively easy to make, most gifted and twice exceptional learners are harder to figure out. Not every psychologist is eager to dedicate that much energy and time. Time is money. Sometimes parents are the ones hoping for a quick fix to what may actually be a rather complicated problem. 8. Emotions get in the way: Parents may want their child to be diagnosed with a learning disability because it seems more hopeful than being told their child has a general intellectual disability. Or because it explains why they are under-performing despite high ability when the real problem is social, emotional, or family problems. Conversely, they may not want their child to be diagnosed with a disability because they feel it would be stigmatizing. Sometimes the emotions or preconceptions of the psychologist influence them to downplay findings to protect parents and child from disappointment. I’ve seen reports that pussyfoot so timidly around a diagnosis that parents are left mistakenly thinking there was nothing they really need be concerned about. This seems to be particularly common with autism/Asperger's diagnoses. And ADHD. And emotional and behavioral problems. 9. Not observing and listening to the student: It never ceases to amaze me how much even very young children know about themselves. Of course they may not come right out and say it, but if they are observed carefully and asked the right questions in a welcoming and nurturing environment, amazing insights come out. Perceptive, sensitive gifted learners have finely tuned antennae making them profoundly aware of exactly where they are not doing as well as their peers or as they’d like. All one has to do is observe and ask. 10. Not observing and listening to the parent: Even though few parents have been professionally trained in picking up these kinds of clues, I find that they often are the first to notice something is up – and the most persistent to find solutions. If they raised the issue with their pediatrician they may have been told it was probably developmental and not to worry. If they raised the issue with their child’s teacher they may have been told their child was at grade level and not to worry. But parents are really good at worrying. When they “know” or "feel" something is up, they should trust their instincts. They're often right. If I can help you understand your gifted or twice-exceptional student better, schedule a time to talk with me by e-mailing dm@drdevon.com.